Research conducted in the University of Helsinki may help in developing specific inhibitors that would slow down actin-dependent movement of cancer cells. Adenosine triphosphate (ATP) produced by mitochondria is the main energy source for chemical reactions in cells. A human typically produces up to his or her own body weight of ATP over the course of the day. A major user of ATP in many cell types is the actin cytoskeleton, which is composed of dynamic protein filaments that provide the force for cells to move around and change their shape. For example in neurons and immune cells, approximately half of the ATP is estimated to be consumed in motile and morphogenetic processes driven by ATP-dependent growth of actin filaments. However, the mechanism by which ATP is loaded to actin has remained a mystery. Researchers at Institute of Biotechnology, University of Helsinki have now discovered that the abundant and evolutionarily conserved protein,cyclase-associated protein, is responsible for re-charging actin monomers with ATP. It converts them into a form that can be used for motile and morphogenetic processes in cells. "Interestingly, the levels of cyclase-associated protein are also altered in many cancers. The structural work presented in this study may open new avenues for developing specific inhibitors that would slow down actin-dependent motility of cancer cells," explains post-doctoral fellow Konstantin Kogan. 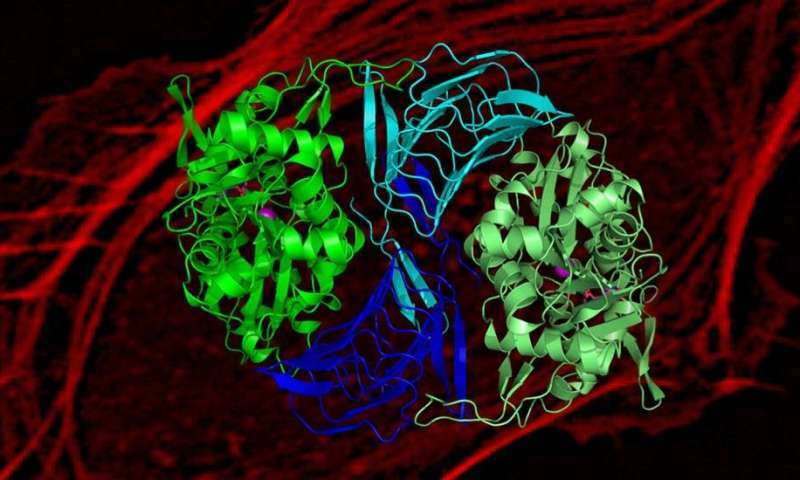 Moreover, by determining the atomic structure of the cyclase-associated protein in complex with actin, combined with atomistic molecular simulations, researchers revealed the precise molecular mechanism by which cyclase-associated protein catalyzes actin monomer re-charging. "These findings not only reveal how ATP is loaded to actin in our cells, but also explain why cyclase-associated protein is present in all eukaryotes and is so important for their life," says researcher Tommi Kotila.